Patriotic Music on Sunday Morning: Yes or No? Author – Ginny Chilton Maxwell is Music Minister at Church of the Ascension in Norfolk, Virginia, where she serves as organist, choirmaster, and elementary music teacher. 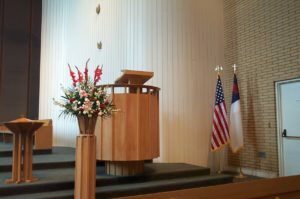 At my church we do three patriotic songs a year: one on the Sunday nearest Memorial Day, one nearest Independence Day, and one nearest Veterans Day. We had to have a conversation about it when I first got here because the newly-appointed rector and I both bristle at patriotic music sung in church. Our church is in a military-heavy part of the country, and the rector and I both come from non-military backgrounds. I have to say, she and I learned a lot from talking with a few members of our congregation about the place of patriotism in worship. We noted, for instance, that there are few institutions in our country that require the amount of sacrifice, obedience, and loyalty that the military does. The rector and I also noted that the people asking for patriotic music were some of the most generous and selfless people we had ever known. There was a gap in understanding there, and the rector and I came away from these conversations feel less confident that we were absolutely in the right. As a compromise, we decided to maintain a place for patriotic hymns as long as they are chosen by the music minister. My job now is to try to choose hymns that put our love of the United States in the proper context, and that has been harder than I thought it would be. As I sat down this year to choose hymns for another Sunday-before-Independence-Day, I began wondering how other worship planners deal with this issue. Perhaps many of you have read Kevin DeYoung’s article from The Gospel Coalition, written in 2011. DeYoung criticizes both sides of the issue– those who adopt too much patriotism in their worship services and those who are too rabidly against it. I know I get immediately turned off at any mention of country in worship, but DeYoung is correct when he writes that “the church is not the state and the state is not God, but this does not mean the church must always be against the state.” Certainly God does celebrate with the United States when it does as Jesus would do. This was a point I took to heart. I decided this year to go for a new tactic with my patriotic hymns task. Instead of doing a traditional hymn, like “My Country ‘Tis of Thee,” I chose hymns that used American folk tunes, like “Let Us Break Bread Together” (an African-American spiritual), and “Simple Gifts” (a Shaker tune). I thought it could be a way of celebrating America on Sunday without worshiping America. Turns out some of my colleagues already had the same idea. The Rev. Stephen Stacks, who is associate pastor at Greenwood Forest Baptist Church outside Raleigh, says they frequently sing freedom songs from the Civil Rights Movement, such as “Lift Every Voice and Sing,” on Sundays that fall near big patriotic holidays. Martha Burford, music minister at Grace Episcopal Church in Lexington, Virginia, included spirituals, folk tunes, Shaker tunes, a Dakota Indian chant, and hymns by American-born composers for July 1st. “Today’s music also offers an opportunity to share in Christian musical narrative in these United States,” Burford wrote in the bulletin. So, it is possible to celebrate America without turning to the National Hymns section of your hymnal. Some of us did national hymns on Independence day, some of us did American-born hymn writers or freedom songs. Another option is to include national hymns but try to put them in the proper context. My colleague Nellwyn Beamon, who works at a church just down the road from mine with similar worship style and demographics, made a more obvious compromise for July 1st. The readings and music focused on world peace and unity, but the final hymn was the Navy Hymn (“Eternal Father, strong to save.”) She feels that singing the Navy Hymn in a peace and unity context puts it in a new light. to thee aloud we cry, God save the state! But something Rev. Stacks said in our conversation made me think harder about my decision to do this hymn. People often think music is “innocuous,” Stacks said, “when, in actuality, it tends to grab your heart.” In other words, it’s difficult to sing any words to America without hearing the original words and feeling the more jingoistic contexts in which they are sung. That felt true to me when we sang it on July 1st, with or without the collect for peace and global unity. I still felt like we were about to break out the fireworks and tiny American flags. The final hymn at my church on July 1st, “God of Our Fathers,” includes only a tiny mention of country (“in this free land”) so I programmed it without overthinking it. But because of the trumpet fanfare intro, and Sunday being only three days away from Independence Day, I felt like we were drumming up a military parade! This hymn definitely “grabbed at the heart,” and as such I think it made much more of an impression on the worshipers than the presence of American folk hymns and spirituals, which I put so much thought into! Reflecting on our experiences this Independence Day with a few of my colleagues made me realize how important context is when it comes to patriotic music in worship. I got in touch with a seminary classmate, David Bjorlin, whose church context is much younger and more conservative than my own. Bjorlin, who is now pastor of worship and creative arts at Resurrection Covenant Church in Chicago, says that his congregational context is largely young, “recovering evangelicals,” and “as such, I would get way more pushback if I did include patriotic songs.” The fact that his church’s worship service on July 1st includes no mention of Independence Day makes a statement in itself. Bjorlin and I both have pastoral concerns for our congregation, and in terms of the music on July 1st, they ended up working themselves out in very different ways! So it seems that there are a lot of options when it comes to patriotic music in worship, but each of them comes across differently depending on the song chosen, its place in the worship service, the setting, and a number of other factors. The songs you choose may even make a completely different impression on individual members of your congregation! It would be easy to say let’s just ignore the whole holiday, but I’m drawn again to the veterans in my congregation, who are as true as any true disciples and for whom a patriotic song on Sunday morning means so much. We’re all here because we love Christ and Christ’s insistence on justice and peacemaking. What is the best way to make that point on the Sunday closest to Independence Day? I’ll keep pondering it. What are your thoughts? My Roman Catholic congregation sametimes sings Lloyd Stone’s (and Georgia Harkness’s) “This is my Song” on Independence Day weekend, to the tune FINLANDIA. This goes over well. One could also use Michael Joncas’s “A Place Called Home” to the same tune with good effect. I do like the idea of using the Navy Hymn. Do you know of any parish that ever sang Chesterton’s “O God of Earth and Altar” on a patriotic festival weekend? Interesting. As a vet from the 1940s, I appreciate the effort and am reminded of all the battles vividly described in scripture. Feel free to use this hymn for the current times: http://clarkscorner.org/hymn50.pdf.